Why you should buy it: I've been a Richard III fan girl ever since I first read Josephine Tey's THE DAUGHTER OF TIME as a teenager. I raged against Shakespeare for his portrayal in RICHARD III, although I'm grateful to my high school English teacher Mrs. Harrison for teaching the play and the history behind it. So it seemed like fate that Philippa Gregory's new book THE KINGMAKER'S DAUGHTER should be released around the same time that it appears that archeologists have found Richard III's body in a car park of all places. I've mentioned before that Gregory is hit or miss for me. I loathed THE OTHER BOLEYN GIRL, liked THE BOLEYN INHERITANCE, but I've really enjoyed her new series about the cousin's war aka The War of the Roses. Only Lady of the River was meh in my estimation. 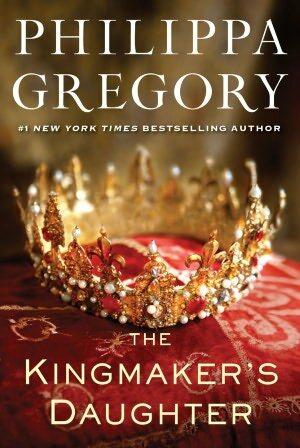 Well, I'm happy to say that THE KINGMAKER'S DAUGHTER is fabulous. Anne is an appealing heroine, and her relationship with her sister Isabel, wife of George, Duke of Clarence will resonate with anyone who has an older sister. Very little is known about Anne which means that in a sense she is a blank canvas ready for a skilled author to bring her to life. In Gregory's hands, Anne grows from a rather naive but feisty little sister, to pawn of her father's ambitions, and then finally a loyal wife to the man she's always loved. I appreciated Gregory's protrayal of Richard as man who is intensely loyal to his family, and who is forced to take drastic steps to ensure the future of the Yorks on the throne of England. My only quibble with the book is that I'm not sure that Anne Beauchamp, the wife of the Earl of Warwick was quite so cold and calculating. She seemed rather harsh towards her children, seeing them more as commodities than her own flesh and blood. Still this was an enjoyable entry to the series. I'm very excited to read this! Also, I wanted to let you know that I LOVE, LOVE, LOVE this blog. I joined today just so I could start commenting. I've seriously spent my whole entire weekend reading this. I'm off to buy your book right now! i love to read this topic ... you have a lot of useful information in this case and the great site, I also delicious Thanks giving and effort evident in it!